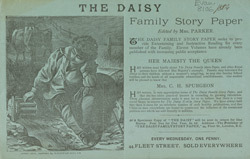 'The Daisy' is here marketed as a "family story paper". Published weekly, it included wholesome and uplifting stories that members of a family would read aloud to one another. The paper's editors write that they had always believed that "there is room for an indefinite number of such healthy publications, and that Christian men everywhere are bound to counteract the influence of the sensational publications which are sold literally in millions." This advert is also a good example of opportunistic marketing, pointing out that Queen Victoria has "written most kindly" about the paper. What she wrote and to whom she wrote it are left to the imagination. 'The Daisy' changed its name to the 'Monthly Home Journal' in 1892. Published monthly thereafter, it lasted until 1896.